If you’re the kind of builder who shops extensively before making a purchase, you’ve probably seen Colorful components pop up from time to time on the domestic market. Certain foreign sellers have long sought to cash in on the U.S. market by filling gaps, and Colorful has the volume to help it do just that. Yet for most of us, the volume that reaches our shores has represented little more than a trickle. 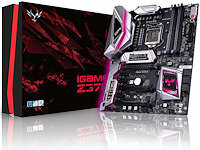 The iGame Z370-X might change all that.